Few have done more to inspire brewing at home than Charlie Papazian, a master brewer, author of how-to books on homebrewing and one of the pioneers of the homebrew movement. His immensely popular book "The New Complete Joy of Home Brewing," has sold over a half-million copies. 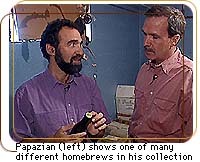 About 20 years ago, Papazian was a nuclear engineering student at the University of Virginia and enjoyed experimenting with beer brewing techniques. 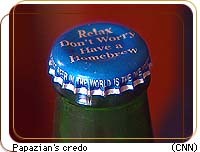 (At that time, homebrewing wasn't exactly legal. Laws prohibiting homebrewing survived as one of the last vestiges of prohibition, and it wasn't until 1978 that the federal government made homebrewing legal. ) Papazian became inspired to share his craft with others. He established the American Homebrewers Association out of his house. Today, the AHA is known as the best educational resource for information on the art and science of making homebrewed and microbrewed beer. AHA's membership has grown to over 25-thousand, up from only 3,000 in 1984. And every fall the AHA faithful, together with beer enthusiasts from around the world, flock to Denver for the renowned Great American Beer Festival. Participants can sample homebrew from among the thousands of entrants in the homebrew competition. The AHA now estimates that there are over 1.5 million homebrewers in the United States alone, and Papazian and his association can claim at least some credit for the growing popularity in microbrewed and homebrewed beers. The AHA also publishes a magazine called Zymurgy -- the first word in brewing and, ironically, the last word in the dictionary. Papazian, who has brewed over 500 different styles of beer, took correspondent Bruce Burkhardt on a personal tour of his treasured homebrew collection. 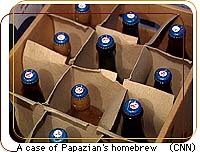 At any given time, Papazian will have about 40 different types of beer in stock at his house -- beer of premium taste and aged to perfection. "I enjoy my beer," he says "Quality. Not necessarily quantity, but quality." Papazian likes to experiment with spices, fruits and other ingredients in his beer. His most exotic recipes contain ingredients such as chili peppers, chocolate, pumpkin and birch wood. Some prized gems in Papazian's private collection include a 3-year-old Raspberry Imperial Stout, an Apricot Ale and a smoke-flavored Swedish beer called Boulders Dricka. One of his favorite beverages to make is called Prickly Haired Cactus Mead, similar to beer but made with honey. "One of the best substances known to man," he adds. Papazian says his beer collection "is what comforts me when I'm traveling because I know that there's always a batch of beer getting better in my basement. No matter what's happening in the world, I know that my beer is getting better." But for Papazian, more important than the ingredients is the attitude. "Worrying can probably spoil the flavor of beer more than anything else," he says.